Bimorph mirrors for laser beam correction and formation were developed and investigated. Different type of substrate and active piezoceramics materials were considered to fabricate temperature independent shape of the mirror surface and to maximize the sensitivity of the mirror. High reflectivity coatings for different wavelengths were studied. Bimorph mirror is the most suitable corrector satisfying these demands. It was shown, semipassive bimorph mirror with 13 actuators effectively reproduces low order wavefront aberrations of large amplitudes . For example, for this mirror theoretical precision of reproduction (RMS) of defocus is 0.3%, astigmatism - 0.7%, coma - 5% and spherical aberration - 6%. But deformable bimorph mirror is not a standard optical element. It is relatively thin; it consists of several layers from different materials with different properties. There are no standard optical technologies to produce bimorph mirrors. Special methods of piezoceramics treatment and training, surface polishing, reflecting coating deposition and so on have to be developed to produce high quality bimorph correctors. Some applications of bimorph correctors in lasers and optical systems for imaging require wide range of deformation and high stability of the mirror surface. These problems would be considered in this paper. Two thin piezo-ceramics plates, one of which has reflecting surface, with opposite direction of preliminary polarization combine a conventional bimorph mirror. In this paper we will consider so-called semipassive bimorph mirrors, which include an additional plate of a substrate. One of surfaces of the substrate is polished to optical quality and deposited by reflecting coating. As a material for substrate it can be used glass, silicon, copper etc. So, traditional semipassive bimorph mirror consists of substrate firmly glued to a plate actuator disk made from piezoelectric ceramic (see Fig. 1). Applying the electrical signal to the electrodes of the piezo-ceramic plate causes tension of the piezo-disc due to inverse piezoelectric effect. Piezo-disc expands in the radial direction. Glued substrate prevents expansion, and this results in the bending of the reflective surface. To reproduce different types of aberrations with the help of such corrector the outer electrode is divided in several controlling electrodes, which have the shape of a part of a sector. By applying a voltage to separate electrode local bending is caused. The rest aperture of the surface deforms to match the boundary conditions. This is property of the modal wavefront correctors, which bimorph mirror belongs to. The size as well as the number of controlling electrodes depends upon the number and the type of the aberrations to be corrected. In our work we usually used the geometry of the electrodes given on Fig. 1. An additional piezo-disk with all-round electrodes can be introduced into the design of the mirror to reproduce of defocus. It can be used also to compensate for general curvature of the mirror, which takes place due to properties of thin multilayer plate, surface errors during the manufacturing of the mirror, thermal instability of the surface flatness and so on. It should be noted, that semipassive design possesses one important advantage against pure bimorph one. There is no effect of discontinuity of the surface between the areas of neighboring electrodes, which are stayed at rather different applied voltages. How to maximize sensitivity of the mirror? We can define sensitivity as a surface curvature, which is produced if we apply unit of electrical voltage to electrode of the mirror: , where d31 is piezo-module, E is electrical field intensity, t is thickness of the substrate. Surface curvature is proportional to piezo-module of the ceramics material, and inverse proportional to the thickness of the substrate. However to increase curvature we can not reduce substrate thickness infinitely, otherwise it becomes difficult to polish to optical quality an optical element, whose aspect ratio (diameter/thickness) is much greater than about 10. If we put thickness as optimal from polishing considerations, to maximize curvature we have to use piezoceramics with high piezo-module d31. Table 1 shows the main characteristics of piezoceramics materials, which are commercial available now. Piezoceramics material PKR-7M from Russia has record value of the piezo-module d31. Therefore, this material can be chosen as most sensitive one for the development of the bimorph mirrors. But, it has low Curie temperature and it is soft segneto-material. Curie defines the stability of piezoceramics properties at high temperatures. It means, we have to have low temperature technologies for ceramics treatment, gluing of the mirror components and deposition of coating. Fig. 2 represents a comparison of sensitivity of the three experimental bimorph mirrors with different type of piezoceramics material. 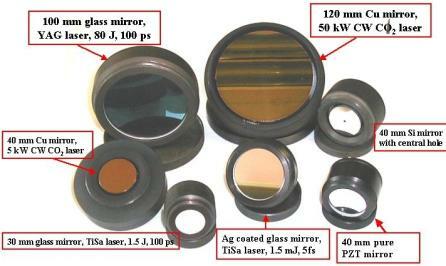 All mirrors were made from glass substrate of 2.5 mm thickness and 40 mm aperture and PKR-6, PIC-151 and PKR-7M ceramics discs of 0.3 mm thickness and 40 mm aperture. The same DC voltage +100 V was applied to the electrodes of the mirrors. Dynamics of the surface deformation was recorded by Shack-Hartmann sensor for every 50 ms. Sensitivity for mirror with PKR-7M ceramics was 1.4 and 2 times higher than for mirrors with PIC-151 and PKR-6 ceramics respectively. For PKR-7M first measurement after switching on the control voltage showed 3.2 μ of deformation value, which increased up to 3.33 μ in 2 sec, then it stayed constant during all time of measurement. So, we can declare, that creep effect for PKP-7M does not exceed 4%. Softness and low Curie temperature make ceramics to be easy polarized and depolarized. Typical hysteresis curve for ceramics looks like a "butterfly" (Fig.3). Depolarization and even reverse polarization phenomena will occur at negative to the polarization direction voltage. We found threshold negative voltage, at which depolarization is began for PKR-7M. This voltage equals -500 V per 1 mm thickness of ceramics. So, to avoid unpredictable behavior of the mirror deformation, the range of negative control voltage should be restricted. Range of control voltage for 0.4 mm thickness ceramics would be from -200 to +300 V. Response of bimorph actuator will remain linear within this range. Experimental hysteresis picture confirms our statement (Fig. 4). One of the important characteristics of wavefront correctors is temperature stability of the surface flatness. The surface instability is basically caused by distinction between the thermal expansion coefficients for substrate material α1 and piezoceramics material α2. In the simplest cases the instability behavior manifests itself in additional defocus deformation of the mirror surface at the change of the ambient temperature. Thermal deformation can be compensated applying to the electrodes of the piezo-disc some additional voltage VΔT, which can be expressed as: . This limits dynamic range of control voltage. For example, for copper substrate (α1=15.9*10-6K-1) almost 20% of maximal range of the control voltage (VΔT≈20%Vmax) should be used to compensate of thermal deformation caused by changing of temperature for ΔT≈5°C. The main criterion for the choice of a substrate material is the thermal expansion value α1, which should be close to α2 for the chosen piezoceramics material (~3*10-6 K-1). Table 2 shows the parameters of optical materials, which are used in manufacturing of experimental samples of bimorph mirrors. Piezoceramics PZT is the most suitable material for mirror substrate. In that case we can ensure an equality of thermal expansion coefficients. That mirror would be ideal for thermal stability. There was problem to polish crumbly ceramics material. But ceramics PKR-7M, which was produced under special technology of heat baking, allowed polishing of surface up to optical quality. Now we can state that we can produce pure piezoceramics bimorph mirror. Next method of thermo-stabilisation of mirror shape is the water-cooling. Water-cooling is very important at application of the mirror in high power lasers, when mirror is heated under laser beam. In this case, channels for circulation of the cooling water have to be made inside of the thin substrate of the mirror (see Fig.5). Such type of mirror we are producing from copper, because copper is good material for mechanical treatment, diffusion welding and optical polishing. Such mirrors were used for formation and correction of beam of the CW CO2 lasers of continuous power up to 5 kW [2,3]. Wavefront correctors should have high reflecting coating at appropriate wavelength. Standard coating deposition technologies require, as a rule, heating of the substrate and vacuum chamber media. To avoid depolarisation of the soft piezo-ceramics deposition of the coating film should be performed at temperature, which is much below than Curie one. Besides heating of the substrate can lead to degradation of the adhesive, whish was used for gluing of the mirror components, and outgassing inside of the vacuum chamber. Another thing, which should be taken into account, is radial tension. Radial tensions in any coating design introduce significant deformation into surface shape of the relatively thin bimorph mirror. Coating design should be optimized to minimize deformation. There should be used coating materials with minimal tensions or chosen pairs of materials with tensions to opposite directions. Special technologies of coating deposition for bimorph mirrors were developed. They do not require heating above 80 degree of centigrade. These coatings are shown in the Table 3. Most of them introduce minimal deformation of the surface. There are high reflecting coatings for almost any wavelength spectra: wide visible for low power beam lasers, wide near infrared for TiS lasers, single wavelength for high power TiS and YAG lasers, and, of course, there is a coating for high power CO2 laser. Using of the substrate material the same as active PZT one should ensure good thermal stability of the mirror surface shape. Bimorph corrector of 41mm diameter, which consists of 3 discs of the piezoceramics material PKR-7M, was developed and manufactured. One of the discs was passive; it was of 3 mm thickness. Surface of this substrate was polished up to optical quality RMS 3 nm and protected Al coating was deposited on its reflecting surface. Another 2 discs were intended to active surface shape control; they were of 0.33 mm thickness. First disc was served for defocus control; second one with 17 control electrodes could be used for reproduction of the low order aberrations. Photo of the pure PZT mirror is shown on Fig. 6, which represents different type of experimental samples of bimorph mirrors. Study of the thermal stability of the PZT corrector surface showed thermal deformation of the surface 30 nm at changing of temperature of the mirror for 1°C. This value is 4 times less than for bimorph mirror with glass substrate LK5 and 18 times less then copper substrate mirror (diameters of the all comparable mirrors were equal). It should be noted, that because of 2 layers of adhesive between piezo-discs, thermal deformation value differs from zero. Deformation and sensitivity of the mirror were studied using Shack-Hartmann wavefront sensor. Deformation range was defined applying 150 V of DC to the electrodes of the first piezo-disc. For this voltage we obtained deformation P-V=2.7μ (see Fig. 7a). For maximal voltage 300 V we would have deformation 5.4μ. If we apply the same voltage to the all electrodes of the second piezo-disc, we could expect twice enlarging of this deformation value (up to 11μ). Fig. 7 represents reproduction of some aberrations (defocus, astigmatism, coma) by pure PZT bimorph mirror. The applied voltages to the electrodes for these cases are presented in the table 4. These voltages were predicted theoretically . Amplitude for astigmatism was P-V=2.21μ, for coma - P-V= 2.28μ. Due to high thermal stability pure PZT mirror could find a wide range of application, especially in field and clinical conditions, where changing of the temperature can occur. For instance, this mirror can be used for correction of image of the human eye retina, received by fundus camera . In some applications of formation and correction of wavefront of the light radiation, for example, in telescopes of the Cassegrain type, laser beams of a ring transverse intensity distribution, corrector can be supported on a central pole . This makes central area less sensitive , but periphery can be moved considerable more. Bimorph mirror, which includes "leg" in the center of mirror aperture, was developed from silicon substrate. Monocrystalline silicon was chosen as the substrate material because it has low density and this can promise high resonance frequency. On the other hand, silicon is more close material to piezoceramics in terms of thermal expansion coefficient (see Table 2). Design of the mirror is shown on the Fig. 8, its photo - on the Fig. 6. This corrector included one-piece 40 mm aperture silicon substrate and pole with diameter of 6 mm, inside of which 3 mm aperture hole was made. 2 piezoceramics rings were glued to the outer side of the substrate. Mirror surface was deposited with protected Al coating. Measurements of the frequency characteristics showed high first resonance frequency 9.1 kHz, this is record value for correctors of 40 mm aperture. Thermal stability of the surface (- 80nm/°C) turned out to be better than for other substrate materials except for piezoceramics one. Heating of silicon mirror made surface convex, whereas for another substrate materials we met concave surface. This was because of thermal expansion coefficient for silicon is less than for PZT. This mirror can be used in telescopic optical system to correct for wavefront aberrations, to stabilize and to control for beam divergence. Such mirror might serve as a concave mirror of telescope, and light beam may pass toward convex mirror through the central hole of the corrector (Fig. 9). Nowadays adaptive optical elements have found application in high power TiS and YAG lasers for wavefront correction, intensity distribution formation, pulse shaping etc. [6,7]. The main requirement to the corrector would be the high damage intensity threshold for the reflecting surface. Several bimorph mirrors were developed for wavefront correction and intensity distribution formation. Glass material LK5 was used for mirror substrate. Mirror apertures varied from 30 to 100 mm. Mirrors had a number of control electrodes from 17 to 33. Surfaces of the mirror were deposited with multilayer dielectric and protected Ag coatings (Table 3). These coatings were loaded by beam intensity density up to ~1012W/cm2. Any damages were not observed on the mirror surfaces at these intensity densities. 30 mm aperture bimorph mirror (photo of this mirror is presented on the Fig. 6) was used for formation of the laser beam distribution in the near field . Mirror was installed in the last amplifier of TiS laser ATLAS at MPQ, Garching, Germany. Homogenizing of the intensity distribution allowed to increase pulse energy from 0.5 J to 1.5 J. Next mirrors of 80 mm aperture and 33 control actuators was used in the same laser for wavefront correction. Closed loop control of the mirror allowed to get almost diffractional limited spot in the focal plane of the non-axial parabolic mirror. Maximal reflectivity for dielectric coating for these mirrors was 99.9% at λ=790 nm. Schemes of electrode configurations are shown in Fig. 10. Maximal deformation of the surface for 80 mm aperture mirror was 30 μ. Deformation for electrodes 2-5 was 2.8 μ, for electrodes 6-17 was 2.5, and for 18-33 electrodes - 2.2 μ. Response functions for several electrodes at 100 V applied voltage are shown in Fig. 11. The response function of electrode of the deformable mirror represents the modification of surface profile of the mirror in answer to reply of unit of the electrical voltage applied to given electrode while other electrodes are stayed under zero controlling signals. First resonance frequency for 80 mm aperture mirror was 1.6 kHz. Table 5 represents a comparison of the parameters of different bimorph correctors. Pure piezoceramics mirror has maximal thermal stability. Silicon mirror has a maximum frequency range, which would be useful in high frequency adaptive optical systems. A.Kudryashov, V.Shmalhausen, "Semipassive bimorph flexible mirrors for atmospheric adaptive optics applications", Optical Engineering 35, pp.3064-3073, 1996. A.V.Kudryashov, V.V. Samarkin, "Control of high power CO2 laser beam by adaptive optical elements", Opt. Comm. 118, pp.317-322, 1995. T.Yu.Cherezova, V.V Samarkin, S.S. Chesnokov, L.N. Kaptsov, A.V. Kudryashov, "Given laser output formation: adaptive optics approach – theory and experiment" In Laser Resonators II, Alexis Kudryashov, Editor, SPIE 3611, pp. 90-101, 1999. A.V.Larichev, N.G. Iroshnikov, I.P. Nikolaev, K. Nesterouk, A.V. Kudryashov, "Depth-sensitive adaptive deconvolution of retinal images", Controlling Tissue Optical Properties: Applications in Clinical Study, Valery V. Tuchin, Editor, SPIE 4162, pp. 158-169, 2000. J.C.Dainty, A.V. Koryabin, A.V. Kudryashov, "Low order adaptive optical system with bimorph deformable mirror", Appl. Opt. 37, pp. 4663-4668, 1998. H.Baumhacker,K.-J.Witte, H.Stehbeck, A.Kudryashov, V.Samarkin, "Use of deformable mirrors in the 8-TW TIS-Laser Atlas", In Adaptive Optics for Industry and Medicine, Gordon Love, Editor, World Scientific, pp. 28-31, 2000. D.Meshulach,D.Yelin, and Y.Siberberg, "Adaptive ultrashort pulse compression and shaping", Opt.Comm. 138, 345-348, 1997.